We are running into the countdown of the 2011 Fall Conference (11/19-20); are you ready? Please expedite your pace to register with the Early Bird discount price (two day full package NT$1,900) for the Conference before it’s too late. The deadline for Early Bird registration is Oct. 31 ! With this letter, we would like to give you some updated info about the 2011 Fall Conference. 1). 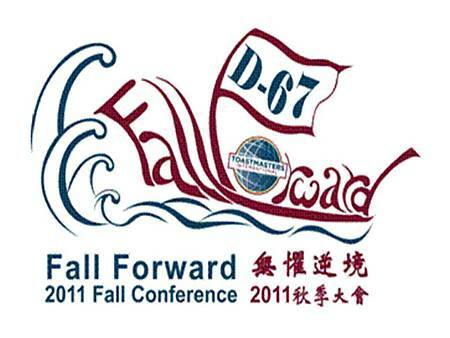 The LOGO of the 2011 Fall Con Theme “Fall Forward” has been completed. It represents the spirit of District 67 : Breakthrough against the headwind; Fall Forward. 2). One of the highlights of the Conference is the dinner party. This year we have arranged one of the classic Live Band. We will listen to romantic music during dinner and dance with hilarious music after dinner. You can “dance until you drop”. You will absolutely feel satisfied. Band info and song list can be found in our Website. 3). Education Training – Beside World Champion Mr. Mark Hunter and International Director Mr. Balraj Arunasalam, we have invited several senior and proficient trainers : Helen Chen, Lester Lin, Linker Lin, Roger Lee and some Chinese/Taiwanese speakers. We are sure you can definitely learn a lot from them. 4). Children are welcome to our Conference and Dinner Party. Children under 12 years will have a red envelop from us, but please register and pay the same amount in advance. Please specify on the registration form for children under 12 (for us to arrange the red envelop). But please make sure your child(ren) can keep silence during contests. 5). Taichung is a city full of wonders and resort areas. If you have extra free time, you can visit the famous scenic spots like: The National Science Museum, The Art Museum, Luce Chapel of Tunghai University, The night market of Fang Cha University,…etc. There is a very convenient spot - Wangaoliao Park (2km from Nanshan Education Center) where you can have a wonderful night view of Taichung city in the mid of the beautiful fall atop the hill with caressing breeze; what a pleasure! 6). Dinner room arrangement - there will be two areas - live band area (40 tables) and quiet area suitable for chatting and night view (15 tables). All table arrangements will be made according to your registration time sequence (the earlier the near to the band). After dinner, everybody can dance in the Live Band area. But for a more spacious dancing floor, there will be 8 tables to be removed after dinner time (around 8:00pm). In case you mind sitting at those 8 tables, please specify in the registration form that you want to sit at the “quiet area”. 7) All detailed information can be found in our 2011 Fall Conference Website (English website : http://www.toastmasters.org.tw/clubs/newcentury-bi/2011fallweb/indexe.html). If you have any further questions, you can e-mail to Teresa Chang (Div. L Gov., Chair of 2011 Fall Conference) e-mail : teresa.chang@yahoo.com.tw . The Website for 2011 Fall Conference in Taichung has been established. Please click below links directly. Or you can either enter the website through the homepage of Toastmasters International Taiwan (www.toastmasters.org.tw). (Choose from the "Activity" - "Fall Conference Website") Some of the new information will be uploaded onto the web pages step by step for members' reference.